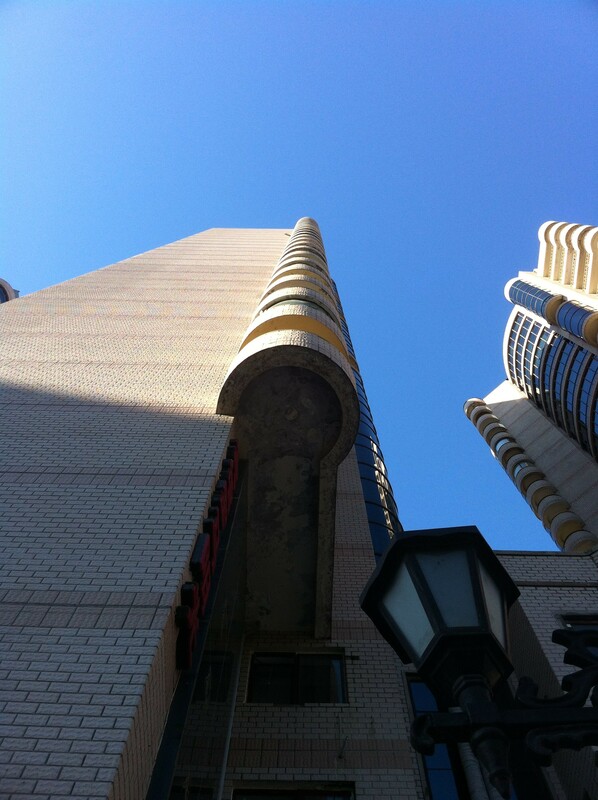 « Day 27 in Beijing: If You Want Light And You Know It, Stomp Your Feet! I’m guessing you know the second part of this song. I have no idea why I’m starting to use so many childrens’ songs in my posts. They just seem to fit. And, maybe, just maybe, it is because after 26 days in Beijing, I’m still feeling like a little kid. When my brothers and I were kids we used to go to a candy store in Palo Alto. There was an elderly African-American gentleman that owned the store. He was also smiling and gracious. I remember him being the kindest person I know. It was as if he was born to run that store and found joy in each moment he was there. To me, it was like I was Charlie and this was a trip to The Chocolate Factory. We would go in, look at the racks of candy, and then pick out a few. My mind my be playing tricks on me but I see myself climbing on the racks of candy and pointing at them. I was about 4 at this time and we had just returned from living in Scotland. Either that or I was 2 and we had not left for Scotland yet. Beijing is my candy store now. This song, for anyone from my generation, is obviously the title song from Mr. Rogers. Mr. Rogers, for those that don’t know him, was an actor on a kid’s television show for many years in the United States of America. Calling him an actor is beyond limiting to who he was as a person. And this is where his, and my story, start. I remember watching him as a kid and being amazed and excited by his ability to find joy in the simplest things. He didn’t judge people that were different. He accepted people as they were. He enjoyed learning about what made them special and what made them different. He enjoyed people being vulnerable. He enjoyed being vulnerable himself. And that is what I truly loved about him. His ability to be vulnerable and share parts of himself that could be childish, immature and slightly embarrassing to a national audience. I never heard anyone say a bad word about him. He was, as far as I’m concerned, a hero. It poured rain last night. I mean poured. This picture does not do the storm justice. The city of Beijing basically shut down for a large portion of it. Taxis stopped running because it rained so hard that the streets flooded. Beijing is flat and they haven’t devised a good run off system yet. Trust me, they will, but for right now, the rain water just puddles up. 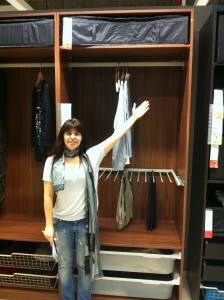 I was shopping with my friend, Nuria, who is from Spain. She works at a local school here with international students. Not only does she speak Spanish and English but she speaks Mandarin very well and can also read it. This is rare. Lastly, she also has a wonderful and giving personality. We met a few weeks ago salsa dancing and have become fast friends already. Nuria spent about 4 hours with me at IKEA helping me stock my new apartment at IKEA. I honestly cannot thank her enough. When we left the store, it was pouring rain like mad. It reminded me of a New Mexico thunderstorm. It took us over one hour to get a taxi…and hailing a taxi usually takes about 1 minute. Nuria stated, “Dey weatherrrr tomorrrrrrow vil be wonderrrrrrful becausssshhh of all de rrrrain twodey.” Yep, that is my poor attempt to have you, dear reader, get a bit of a taste of her beautiful Spanish accent. I’m not mocking her. I love accents. Personally, I think mine is boring. But, then again, it seems everyone thinks their own accent is boring. Well, Nuria, who has lived in Beijing for about 6 years, was right. The beautiful blue sky in Beijing after a night of rain. 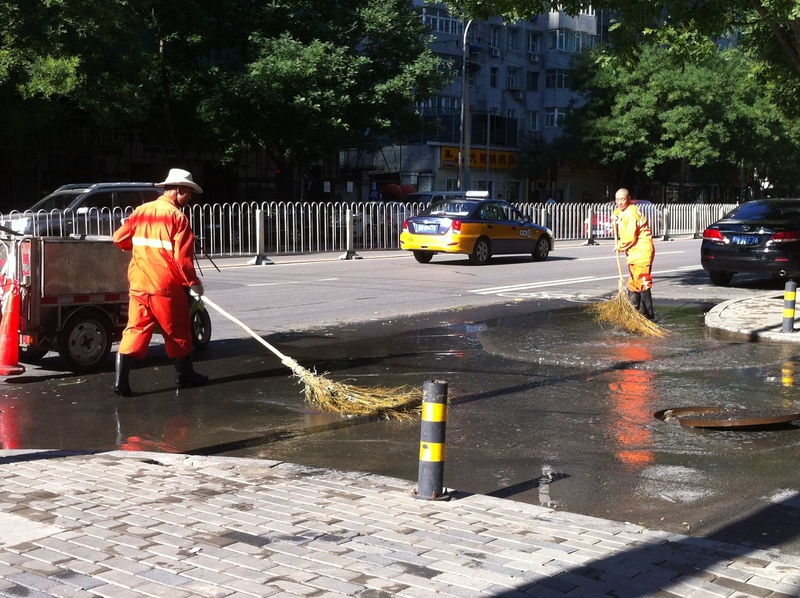 Two men sweeping the left over flood water into a sewer drain. The pollution was gone and the morning was glorious. I kept smiling and looking up at the wonderful sky and thanked the breathtaking storm for allowing me to taste one more piece of Beijing candy. I happened to walk by these two men sweeping the rainwater into a sewer drain.